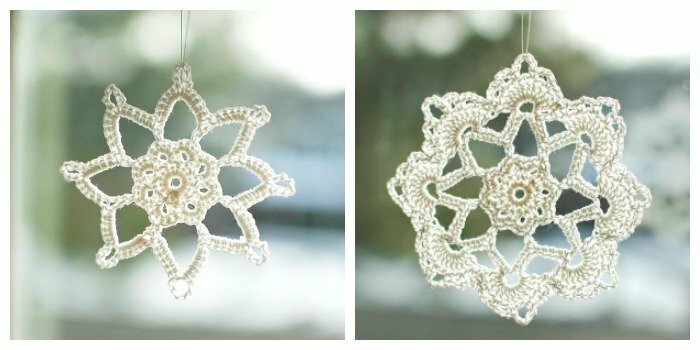 According to family lore, Grandma Jennie’s Snowflake Patterns were the envy of all who saw them with an immediate request for the pattern! Grandma Jennie couldn’t decide which ending round she liked best so she alternated making the two for a truly beautiful winter window display. Many readers were very excited about this design when I recently posted about these free snowflake designs. Scroll down for these free patterns or get them as part of a Set of 4 Snowflakes eBook, a convenient ad-free pdf download for purchase here in my shop or here on Ravelry. Resources and tutorials you may find helpful in following this pattern: Crochet Abbreviations, U.S. to U.K. Crochet Conversion Chart. Finished snowflake measures approx 3½ in. Ch 6, join with Sl st in furthest ch from hook to form a ring. Round 1: Ch 1 (does not count as st), work 16 scs into ring, join in 1st sc of round — 16 scs. Round 2: Ch 1 (does not count as st), beginning in same st as join, *work [1 sc, ch 3, 1 sc], skip next st, rep from * 7 more times, join in 1st sc of round — 8 ch-3 spaces. Round 3: Ch 1 (does not count as st), work 5 scs in each ch-3 sp around, join in 1st sc of round — 40 sts. Round 4: Sl st in next 2 sts, ch 1 (does not count as st), work 1 sc in same st as last Sl st was made, ch 10, skip next 4 sts, *work 1 sc in next st, ch 10, skip next 4 sts, rep from * around, join in 1st sc of round — 8 ch-10 spaces. Round 5: Ch 1 (does not count as st), work [6 scs, ch 6, 6 scs] in each ch-10 sp around, join in 1st sc of round — 8 ch-6 spaces. Follow pattern above for Rounds 1 through 5. Round 6: Sl st in next 5 sts and in ch-6 sp, ch 3 (counts as dc), work 12 dcs in same ch-6 sp, work 13 dcs in each of the next ch-6 spaces around, join in top of beg ch 3 — 8 groups of 13 dcs. Round 7: Ch 1 (does not count as st), beginning in same st as join, *sc2tog, ch 3, skip next st, 1 sc in next, ch 3, skip next st, 1 sc in next, ch 5, skip next st, 1 sc in next, ch 3, skip next st, 1 sc in next, ch 3, skip next st, sc2tog, rep from * around, join in 1st sc of round — 40 ch spaces. For best results, block snowflakes after finishing. Pin the snowflakes right-side down onto a blocking mat, making sure to straighten each snowflake point. 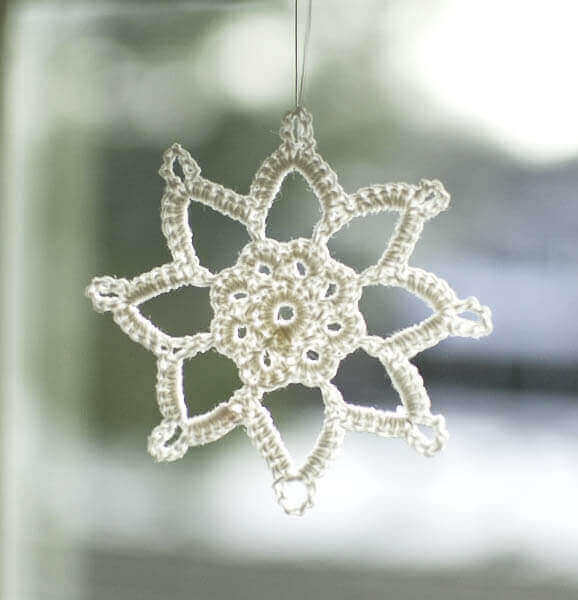 Using a small paintbrush, apply a thin coat of fabric stiffener over the snowflakes. Let sit until dry or as long as directed on the stiffening product. 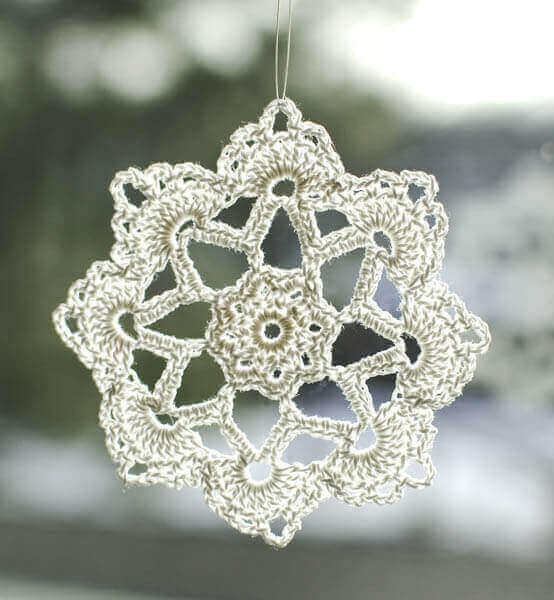 Once dry, sew a piece of thread through the top of each snowflake and knot the thread to create a loop. Oh, that’s gorgeous, Kara! Thanks for sharing at Hookin On Hump Day! ah it is so beautiful! Your snowflake is so pretty and delicate. I can’t help wondering what Part 2 is. Too beautiful and delicate!Thanks so much for sharing pattern! How lovely! You should have a tree full of them! These are just so beautiful. My gram used to have some on her Christmas tree. I never asked if she made them herself! Thanks for sharing, Kara!! Beautiful! Thanks for the pattern. Oh wow, so delicate, so lovely! Pretty, quick, and a so simple pattern = the perfect project for a cold afternoon. Just stopping by to invite you to a new link party I’m starting. It is for OLD posts–and you have so many wonderful old posts that I often look through. Please come over and share the best of the best. Just because its not new doesn’t mean it doesn’t desire to be pinned again!